Tuesday 30th January - Round-the-Block road race at 12:30 at Cranford*. See below. Thursday 1st February - Dream Mile on Bath Road from 12:45*. Saturday 10th February - Men's and Ladies Surrey League matches. Whilst I don't myself do cross country races I did take time out on Thursday to visit Cranford park and do one lap of the circuit. I reported to Gary that the course was fine. Well, maybe that with a couple of dry days and a small course adjustment it would be...and I was right because come Sunday it was. We had a good turnout with 17 from British Airways AC and guests of four from Woking AC, two from Shepperton and two from Milocarians. The men raced over three laps. The ladies raced over two laps, with an optional third to prepare them for the day when cross country race distances are equalised. The two and three lap courses were measured (by runner's GPS watches) at 2.88 miles (4.6k) and 4.28 miles (6.9k) respectively. Katie Hopkins was first finisher in the women's race with Julie Barclay second - narrowly ahead of Kay Trinda such that on the optional third lap Kay managed to overtake Julie. In the men's race Paul Knechtl realised that the two Milocarians were going to work together so he ran a tactical race - staying just behind the two for the first two laps and then after stripping off his extra top he stretched out on the third lap to win by nearly 45 seconds. As this was the BA championships the two winners were Julie and Paul. The course was set by Gary Rushmer with assistance including from Tom Rowley. We were honored to have Tom helping at our event on his 91st birthday. 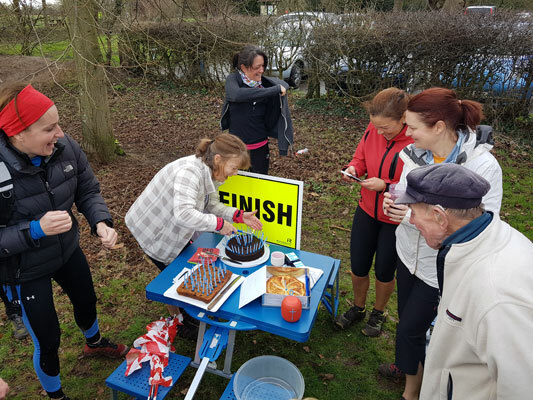 Most runners wished him a happy birthday as they passed him on each of their laps. At the end various cakes and goodies appeared and we made it a proper celebration - though Tom was probably relieved that it proved impossible to light all of the 91 candles put on the cakes so he only had to blow out a dozen or so (photo at end of digest). Thanks to Gary and Tom and also the other members of the club who turned up to marshal and support - John Williams, Anne Coffey, Paul Brandon, Harry Wild, Jane Taylor, Joe Nolan, Paul Watt, Clara Halket and others. 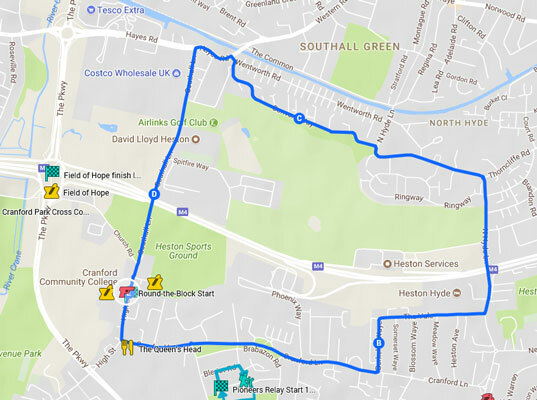 This year the traditional Round-the-Block race will have a course of exactly one lap around the block which has been measured at 3.4miles / 5.5km. The course is shown on the club map and reproduced here. The start and finish line will be across the road from the Cranford Community College and it may prove possible to park immediately adjacent to the course here. Please note that we have no car parking or changing facilities at either "Heston Venue" or at the college, either before or after the race. The Queen's Head is available afterwards for those needing refreshment - 5% discount if you show your BA Club's card. Traditionally we charge £1 to participate in the Round-the-Block race and this is donated to the White Lodge charity. Non-runners are also welcome to help at the start / finish. The last match of the season is at Richmond Park on Saturday 10th February. Please note that we start at 11.00am. Unfortunately I won't be there that day. If you are running and this is your first match this season, Monica will give you your bib number on the day. Please bring some safety pins with you. 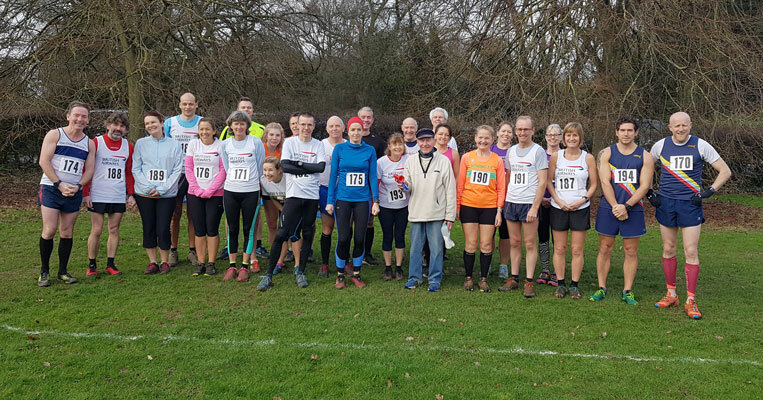 Please find attached race information and course maps for the fourth and final Surrey League fixture of the season, in Richmond Park, on Saturday February 10th. We are using a new course, with a new start/finish location. Division 1 and Division 2 Senior Women will run in separate races, Division 2 starting at 11 am and Division 1 at 1 pm. The erection of flags and banners is permitted, but not tents. Nor is the use of bells, horns or other instruments. If you have any query, please let me know, otherwise have fun on the day. A damp cool evening after a day of heavy rain greeted the three runners who took on the course from Cranford for the first time in 2018. Steve Hillier headed off first but was eventually overhauled by an improving Roderick Hoffman. London Marathon bound Chris Kelly had jogged over from Harlington to reach the start and returned to his office on foot afterwards. He was also fastest by a considerable margin and with Trish McCabe away in Australia moved to the top of the league table. Only the best four scores will count in the final reckoning so with two runs still to come the result is still wide open. The next run will be on Wednesday 21st February. 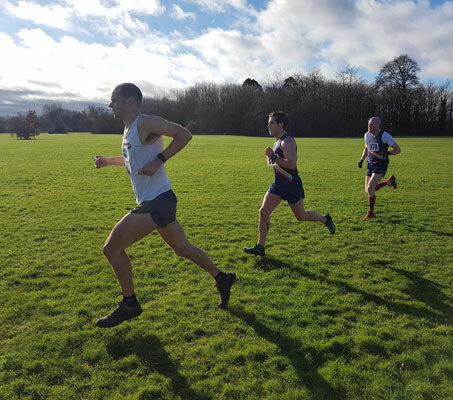 Some of our parkrunners were clearly saving themselves for the club cross-country championship but there was plenty of tourist activity this week and four more parks were added to our list. ‘Down’ in Australia Trish McCabe (30:16) and Maureen McCabe (37:46) were at Noosa on the Sunshine Coast in Queensland with an 8 a.m. start at GMT+11 while further to the South David Duggan (30:48) was at Sunbury in Victoria a little to the North and West of Melbourne airport. In the UK Roderick Hoffman (27:19) and Sarah Gordon (32:37) visited Rutland Water. Sarah had run there previously but before she became a member and improved on the time she ran in 2016. Neil Frediani (29:24) was further north and west at Cuerden Valley in central Lancashire. Helen was doing her best with the lighter, but the wind was never going to let her succeed. Hi to every one that turned up for the BA XC Champs on Sun. 28th. Some knew it was my birthday and it made Gary’s work marking out worthwhile. He did leave a few puddles around for fun. A big thank you for all the goodies / candles / music / and the BREAD PUDDING and the cuddles (some from the ladies too). Clara’s picnic tables certainly worked and stood the weight you all made my day wonderful and the Milocorians for their wishes and support. I will do my best to come along to every ones 91st. No promises but I can chase my dreams.